For all the massive – and deserved – success that Marvel Entertainment has accrued in the last decade with its film incarnations, last year’s underwhelming Iron Man II suggested that the studio seemed more focused on Forthcoming Attractions – specifically, the set-up for 2012’s Avengers – than generating a coherent film that could stand on its own merits. The debut of Shell-Head’s fellow Avenger Thor, however, shows a lesson very swiftly learned. Hugely enjoyable, suffused with engaging good humour and, for the most part, vividly-rendered, the Kenneth Branagh-directed blockbuster provides The God of Thunder with a strong screen debut, instantly banishing memories of the character’s ultra-lightweight, low-rent appearance in the 1988 TV-Movie The Incredible Hulk Returns. Following a brief introduction to storm-chasing scientists (Natalie Portman, Stellan Skarsgard and Kat Dennings), the film’s rush to the magical, cosmic realm of Asgard quickly shows why Branagh was a fine choice for this material. Amdist gorgeous vistas – golden towers overlooking moonlit seas which stretch off in to infinite space (all of which look great in 3-D) – Branagh brings his extensive Shakespearean background to bear as Asgard’s battle-worn King, Odin (Anthony Hopkins, bringing the RSC), prepares to hand over the throne to favoured son Thor (Hemsworth), while brother Loki (Tom Hiddleston) looks on with simmering jealousy. 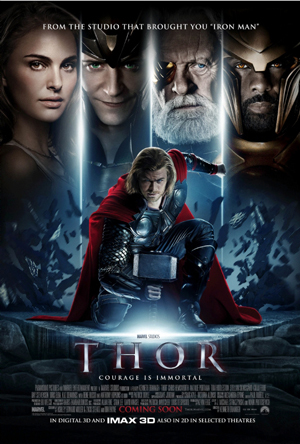 The fractured Father-Son dynamics give the film a fine dramatic core as the brash and arrogant Thor, who impulsively fancies being a warrior King rather than a peacetime one, jumps at the chance to bring the hammer down on neighbouring enemies The Frost Giants (led by Colm Feore’s Laufey) when they make a secret incursion to Asgard to steal back the source of their powers. Joined by Loki and fellow warriors Volstagg, Hogun, Fandral (The Warriors Three in the Thor comics) & Xena-like Sif, the ensuing smackdown in the freezing tundra’s of Jotunheim is a vigorous action high-point that subsequent set-pieces struggle to match. Triggering a new conflict – and Odin’s extreme displeasure – Thor is banished to Earth a mortal (with a tight-fitting t-shirt), along with his fabled Mjolnir, embedded in a rock where it can only be released by “the worthy”- not, alas, Stan Lee in his customary cameo – the latter attracting the attentions of Portman and soon after, S.H.I.E.L.D, led by Clark Gregg’s Agent Coulson. If Thor’s (rather brief) banishment to “Midgard” slackens the pace somewhat, it’s leavened by some wonderful and endearingly-goofy fish-out-of-water antics: Hemsworth imperiously walks in to a small town pet shop demanding “Bring me a horse!”, only to be told by a sheepish clerk that they only have dogs, cats, mice etc, to which he retorts “Then give me something big enough to ride!”. Hemsworth, so memorable in his small turn in JJ Abrams Star Trek as Kirk’s doomed father, is undoubtedly a star in the ascendant: he showcases gigantic charm as the humbled God, suitably regal and comanding in the Asgardian sequences while forging great Earth-bound chemistry with Portman’s Jane Foster, whose flustered look when she spies Hemsworth’s utterly-cut torso and girlish giggles in response to his smiling chivalry probably didn’t require much acting, one suspects. He also has a great foil in Hiddleston’s great turn as the quietly-malevolent Loki, a politically-minded trickster with a simmering sense of entitlement. Idris Elba also registers strongly with his limited time as Hemdall, guardian of the Bifrost bridge. Thor is peppered with small issues: Rene Russo’s turn as Odin’s wife Frigga is so small that she might want to change her agent; Jeremy Renner’s fanboy-baiting cameo as Cliff Barton a.k.a The Avenger’s Hawkeye is largely pointless (he’ll basically be seen as “The SHIELD Agent Who Uses A Bow”); the presence of Thor’s Asgardian comrades on Earth stokes the camp-o-meter and the third act’s small-town carnage possesses echoes of Superman II (you’ll be yearning for a swift return to Asgard and a more epic backdrop, that thankfully comes). Indeed, the choppy nature of the second half strongly suggests that there was loads of material left on the editing room floor ( Thor and Jane’s burgeoning romance feels sketched as a result) and that an extra 20 minutes could have been justified. Yet, Branagh’s film is possessed of such bright and breezy fun – “It’s a superhero movie, but with a bit of Shakespeare thrown in”, as Hopkins observed – that such misgivings are easily forgiven. It covers the key bases of a fluid origin story, a good sequel set-up (make sure you stay for the end of the final credits) and, yes, furthering the stage for next year’s Avengers, but never at the cost of an engaging and invigorating introduction to Thor and his world. After the dreadful folly of Sucker Punch, Thor is a proper opening salvo for this year’s blockbuster season and, if Captain America and X-Men: First Class deliver on the fulsome promises of the trailers, 2011 may well be a banner year for Marvel’s film unit. For verily: it kicks Asgard.